Welcome to my new blog. Arrived home to find the self seeded pumpkin plant growing out of my compost heap had yielded seven whoppers. It is autumn here in Jamieson. After a relatively wet summer, the grass is green (it is usually brown at this time of year), and the first of the winter fronts is blowing up from the Southern Ocean. This is the autumn break, time to harvest. 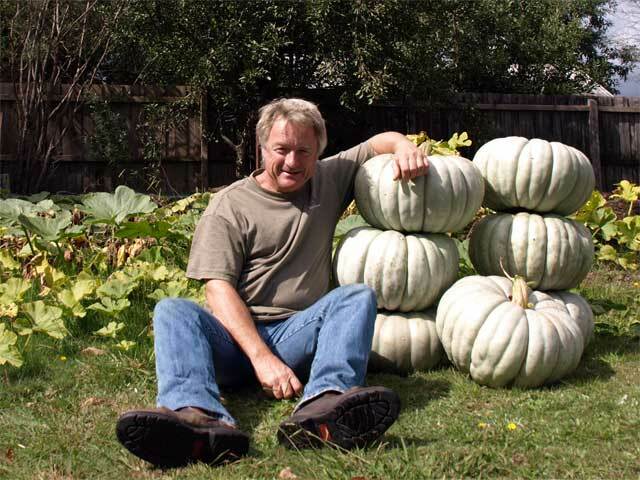 These pumpkins are Queensland Blues, and have a hard skin, so they will store well. It is best to leave them in the sun for around ten days for the skin to cure, and then store them away from direct sunlight in a cool place. I’m going to keep mine on the front porch, which is southerly facing and therefore in the shade (southern hemisphere). I’m going to place them on some straw and lay them on their sides, they should keep for at least three months. Autumn is a great time of year here in Jamieson. Surrounded by blue mountain ridges cloaked in tall eucalypts, the valley is full of deciduous trees, so the colors are spectacular. The days are usually warm – the nights cold – and when the sky is clear the milky way is so bright the valley glows in silver starlight. Autumn is a great time in the kitchen for many reasons. Firstly it is finally cool enough for me to fire up my slow combustion wood stove. It is duck season, so all the smart ducks are hanging around within the town limits, some of the less smart ones are in my fridge. The last of the wild blackberries are still to be found. My figs are finally starting to ripen, they are late this year. I net the tree to stop the satin bower birds, king parrots and crimson rosellas from eating them. Soon the pine mushrooms (saffron milkcaps) will appear, along with wonderful field mushrooms. Autumn is also a time for me to start preparing for my desert expeditions. The first is the Canning Stock Route in June. The swags have all been sunned and aired in the vineyard. The trailer has had new truck springs mounted, and this week I pick up a new Landcruiser. I have another six weeks cooking in a kitchen, and then I am outback for three months cooking with cast iron and coals. I hope you subscribe to my blog. Share my food as I upload the meals that I create both here in Jamieson and out in the desert, and join me on my adventures in the deserts, mountains and on the high seas. I will be uploading recipes and stories as they happen, so be sure to subscribe for updates. I’ll bring one with me when we visit if you can wait that long? I’m no cook but have a favourite pumpkin soup recipe thats a bit different. Add a few granny smith apples and a few stalks of basil leaves to your pumpkin. Salt & Pepper. I sprinkle some paprika for an extra bite on those very cold days. Thanks for the tip Robyn, the apples are a great idea, I still have all my pumpkins on the balcony, and there are some wonderful apples growing up at Kevington (if the birds haven’t finished them off) Thanks for posting. Look forward to seeing your recipes, very exciting. And pictures please, love always seeing lots and lots of pictures. Safe travels. Hey, Hatch looks great. If I wasn’t on the other side of the planet I would drop in for a sandwich. Thank you for reaching out!! !